When Manor Park first reopened as Anna’s Welsh Zoo there was only one rhino – this fibreglass model which we have taken many photos of over the years. This photo and GIF were taken when we visited Manor Park Wildlife Park at Halloween. In 2012 real rhinos arrived at Manor Park, Zamba and Jamba, a pair of Southern White Rhinos (fun fact: rhinoceras means nose horn). White rhino can weigh over 3500kg and are considered to be the second largest land animal after the elephant. This photo of the rhinos framed by the trees appeared in our post Fifteen Reasons Why We Love Manor Park. In 2013, Zamba and Jambo welcomed a new rhino friend, Zuberi to their Welsh home. There are now three boy rhinos at Manor Park. Eventually, these boys will mature and go on to join a breeding group to ensure the continuity of this wonderful species, for now it’s fun to watch this bachelor herd play and roll about in the mud together. 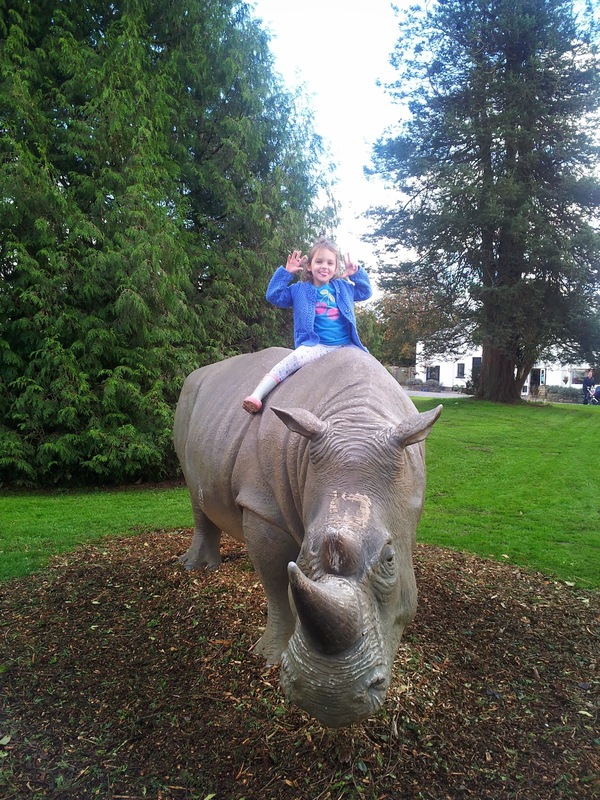 If you love rhinos there is a special Rhino Experience available at Manor Park. In 2015, Folly Farm welcomed the first black rhinos to Wales and Izzy and I were invited to meet them. The above photo shows Manyara first getting used to her new paddock. The male rhino, Nkosi, was next door. Black rhinos (as well as white rhinos) are all actually grey. On our more recent visits the rhinos have been completely settled in their home and enjoying their outdoor environment. They are also part of the European Breeding Programme. There is a Rhino Experience available at Folly Farm so rhino lovers have many reasons to visit Pembrokeshire. Sadly the number of rhinoceros are declining as they are hunted for their horns and suffering habitat loss. Pembrokeshire in Wales is playing a part in ensuring the continuity of these two species of rhino- white rhino and black rhino. With their help and worldwide support we can all make sure there continue to be five rhino species forever, the greater one-horned, Sumatran and Javan rhinos. To find out more visit World Rhino Day 2017.